You’ve heard of uptown, downtown, shanty town and funky town? Now meet Poison Ivy town! Well, it’s not really called that, but in translation that is an approximation of what the famous Guatemalan town of Chichicastenango means. 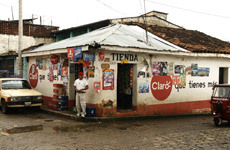 “Tenango” means “place of” and “Chichicas” refers to a local plant with similar properties to poison ivy. Once you brush up against it, you are itching all day. While we were itching to see the famous Sunday market, we were spared a brush with the town’s namesake. Chichicastenago is located about 3 hours northwest of Guatemala City. June is the rainy season and true to form, it was pouring that morning when Julio, our guide and driver picked us up at 6:00 am for the drive. About 1/2 way to Chichi, in the department of Chimaltenango, we made a stop at Chichoy (in this case, “chi’ means “a place” and Chichoy refers to ‘the place on the bank of a river”. It is well marked on the highway and in fact most tour groups travelling to or from Chichicastenango stop there for a bite to eat. Fortunately they had a table right in front of the wood burning fire place for us to warm up, and enjoy a traditional breakfast of coffee, oatmeal porridge (more like soup—but tasty nonetheless), fried eggs, refried beans and toast. The place was pretty packed with travellers and there were at least two groups of students who, dressed in shorts and T-shirts, clearly did not envision the cold rainy day (of course we all like to think of vacation time as taking place in hot, sunny weather). Back on the road we passed through two small Sunday street markets, before arriving in Chichicastenango. The town is famous for its very traditional and sometimes touristy handicraft market, the colourful costumes worn by the shop and stall-keepers, and the lively local market that takes place just behind the main streets. 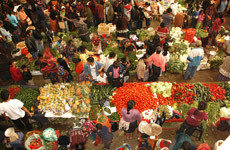 The market area of the town covers about 6 blocks so getting lost is not really a concern. The main meeting point is the Santo Tomas Hotel, a prominent landmark featuring Spanish colonial art, a beautiful inner courtyard full of exotic birds, and a fairly decent dining room. This is also one of the few places where you can use the washrooms. Well, to be perfectly accurate, you need to pay 5 Quetzals to use the washroom (about 65 cents Canadian). We arranged to meet our driver in 4 hours time and then set off to wander. 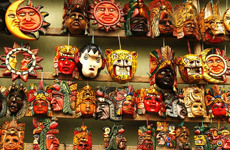 I will say that I collect masks from around the world and the masks at Chichicastenango are wonderful: Very colourful and detailed and, well, there are hundreds to choose from. If you hunt around you can compare the quality and find some real treasures for your home (or drop by my office in Toronto to see a few!). And it helps to have some bargaining experience because you never pay the price that is initially suggested by the seller. The best deal was a pair of masks where the seller asked for a total of 800 Quetzals (about $100.00 CAD) as the starting price. I bought both for about $30.00 CAD. As I was aware of comparable prices asked by other mask sellers, I did not feel that I was being unduly firm in my bargaining, but that we both received fair value for the merchandise. In fact, many times when I bargain, I may feel that the first price mentioned by the seller is realistic, but I will bargain lower in the spirit of the buying process, and once we agree on a final price, I give the seller the initial price he/she asked for. It is all in the game, as long as you (the tourist) keep in mind that you are dealing with someone’s livelihood and price you pay affects the food and shelter they are able to provide for their family. Always bargain realistically, in good faith and with a sense of humour. After the mask buying frenzy died down, it was time to look at souvenirs to bring home for friends and family: textiles, shoulder bags, wallets, local coffee, wooden statues, T-shirts and hats. And of course, the photo opportunities are amazing. It is always a show of good manners to ask permission before taking someone’s photo and, armed with finger puppets for the kids, I was fairly lucky at having parents agree on photo sessions. But in addition the crowd photos featuring the bright coloured clothing of the locals was a highlight of the trip. 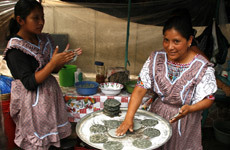 For the record, Guatemala is a country of roughly 21 different indigenous groups, which comprise about 80% of the population. The local market, hidden sometimes down alleyways away from the handicraft/touristy stalls, sells everything from fruit (bananas, pineapples, papaya, sometimes rambutan, and plantain) to colourful vegetables, as well as what you would expect to buy in a market: dishes, pots & pans, kitchen utensils, practical clothing, shoes, floor mats and more. And then there is the food section! While we chose not to indulge in the street stall food, the smells of tortillas, grilled corn, guacamole, beans, grilled chicken and beef and pork were tantalizing, to say the least. A sudden downpour caused us to seek refuge in one of the two small churches in the market area. As we huddled inside, a very elderly, slight woman kept looking my way and subtly motioning that she wanted money. I did not react but I knew that she was no stranger to hard times and now she sat alone on a wooden church pew looking for some consideration. In the spirit of the opportunity that this amazing day was providing for me, I gave the woman some money to help her out and the look on her face were all the thanks that I needed. We ended up spending an extra hour in the town—and all we wanted to do with the time was wander the streets, take photos, sit on the church steps with the flower sellers and be both observer and participant to this timely market ritual. Poison Ivy Town—Chichicastenago- holds a market on Thursdays and Sundays each week. It is a perfect place for niche market travellers looking into aspects of history, culture, people, crafts, photography, textiles, or those just looking to educate themselves about a country that many North Americans don’t seriously consider when they think about vacation destinations. Perhaps its time to think again!